Ski and ride at Wolf Creek ski area! Mountain Landing Suites and RV Park offers some of the best RVing and Lodging in Pagosa Springs, Colorado. Conveniently located for all of your recreational needs, local shopping and dining. Clean suites are well built and stocked with all the comforts of home: oven with stove-top, toaster, coffee pot, microwave, table settings, flat-screen TV with cable, VCR/DVD players, free VCR movies, air conditioning in the summer months and much more. 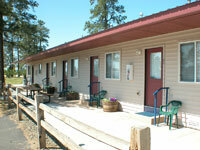 We also offer free WIFI for both the suites and the RV Park. Mountain Landing is surrounded by pines and wildflowers. You can breathe in the fresh mountain air without being far from all the local activities. All units are smoke free. Small pets welcome with approval. In addition to our suites, Mountain Landing has recently added a R.V. Park with 36 full hook up sites (with 30/50 amp) bathhouse, and laundry facility available. You will enjoy the natural beauty of the wooded 5 acres and all of the spacious sites are nestled among the trees for RV camping in town just like you are in the forest. Please note RV park is open May - Oct and Closed Nov. - April. Suite guests play with the kids on our playground, cook your fresh catch on our BBQs, shoot some hoops, or pitch horseshoes. Suite guests relax in our swim spa or workout in the exercise room. We have added a laundry facility, and you may surf the web at our high speed Internet station. WIFI is also available in all of our units and the RV Park.